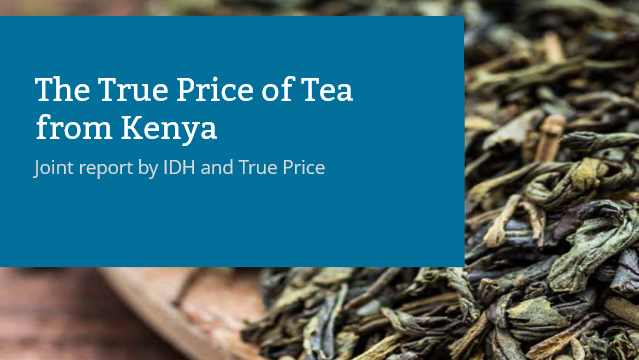 Today True Price and IDH, the Sustainable Trade Initiative launch the report The True Price of Tea from Kenya. Kenya is the third largest tea producing country in the world. About 10% of the global tea production comes from Kenya. For Kenya itself, this represents approximately 25% of its total agricultural export income. Tea production in Kenya is predominantly in the ownership of smallholders. Around 550.000 smallholders produce 60% of the total tea production of the country. Many societal costs occur during production, such as use of scarce water and forced adult and child labour. This study shows that the majority of the external costs of conventional tea cultivation exists of social costs (79%), of which 29% are due to underpayment of hired and family workers. IDH, Rainforest Alliance (RA), Unilever and the Kenyan Tea Development Agency (KTDA) aim to transform the Kenyan tea sector through training and certification of smallholder tea farmers in the Farmer Field School (FFS) program. 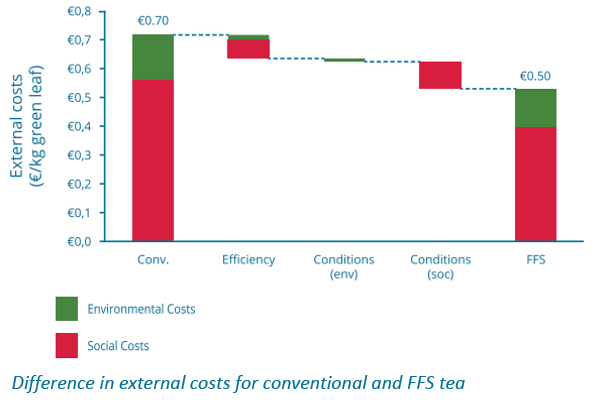 Key findings include that external costs of tea cultivation from an FFS farm are about 29% lower than conventional tea. 40% of this change is due to higher productivity of FFS farms, 10% due to improved environmental conditions and 50% due to improved social conditions. There are demonstrably higher wages, less accidents and reduced fertilizer use on FFS farms. Nonetheless, this study identified that interventions, such as raising wages up to living wage and using a net-zero deforestation strategy, can still further decrease the external costs of FFS tea cultivation. This report is a publication in a series of reports about the true price of soft commodities (cocoa from Ivory Coast, coffee from Vietnam, tea from Kenya and Cotton from India). For more information on the true price and potential interventions to reduce the external costs of global commodities, click here to download the report.